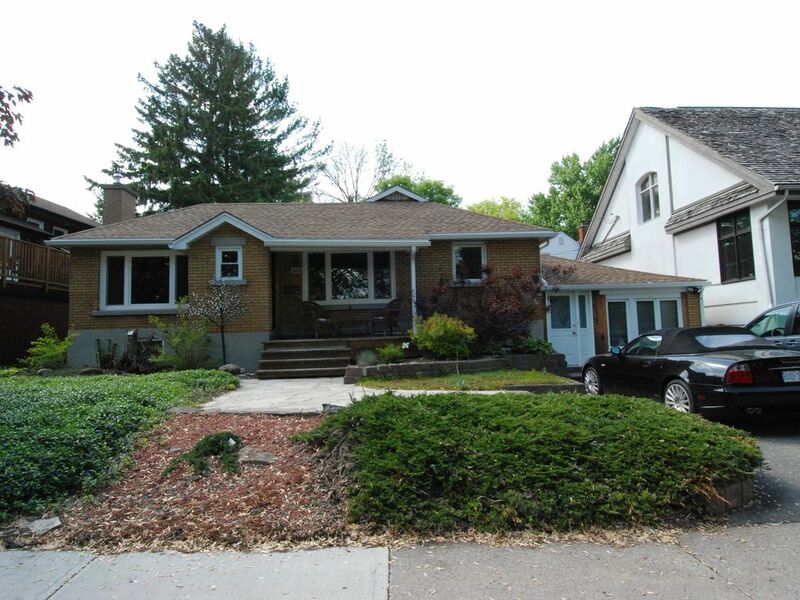 This beautiful 2 bedroom bungalow home is located directly on the Rideau River in the heart of Ottawa. With stunning views of the water from the kitchen, dining room and living room areas. Sit on the front porch and enjoy the tranquil scenery of the River, all while being right in the middle of the City of Ottawa. Rental is for entire house, so you will have lots of privacy. Incredible access to trails along the waterside, for walking, running or biking. Currently renting as a 2 bedroom with en-suite bathroom. Kitchen, dinning area and 2 living rooms on the main level with a gas fireplace. Backyard boasts a large deck and gas BBQ. Ideal for traveling professionals. The basement is equipped with a full home gym including a treadmill, television, free-weights and heavy duty pully weight system. Exercise indoors or outdoors along the river side trails. Tennis courts and outdoor hockey rink available, just a 5 minute walk away. A short walk to the canal for skating when the canal is open in the winter months. House is close (5-10 minutes) to Landsdown Park, the Glebe, Elgin Street and downtown. 5 minutes to the east/west expressway. Main floor bathroom features a stylish glass shower, toilet and sink with large mirrored vanity. There is a second bathroom in the basement including a bathtub/shower combination. Amazing waterfront views from the kitchen, dining room, living room and front porch. A great place to enjoy your morning coffee. 2 living rooms on main level. First more formal living room over looks the River and includes a gas fireplace. Second living room near the rear of the house has 2 sofas and a large wall mounted T.V. CD player and speakers in dinning room and formal living room. High-end speakers. Front deck overlooking Rideau River. Large backyard deck. We had a nice stay at this property in March. There is lots of room in this house and it is well stocked with everything you will need. The location is great, by the river with a large park a couple of minutes walk away. Downtown is only a few minutes away. The second bedroom in the basement was a little cold however the supplied heater helped. We would stay here again on future trips! The house was spacious, clean, well equipped and comfortable. The layout is unusual and the kitchen is a little cramped, but that did not detract much. It was nice to have two sitting rooms and also the large basement with bedroom and bathroom so that our adult daughter could have some privacy. It would have been nice to have: bar soap in the bathroom, a snow shovel, a functioning Bodum coffee maker (the top piece was missing) but we had no other issues. The view was lovely and we enjoyed the walk along the river, just across the street. Also, lots of room for two cars. Location was good, convenient for everything we needed to get to. We hosted our family Christmas dinner for eight people here and it worked out beautifully, using the lawn chairs for a few of us. Definitely recommend Lisa's house especially if you are going to be in Ottawa for a few days or longer-term. We stayed in this lovely home as longer stay guests in order to access convenient medical care at both the Ottawa General and Riverside campus. The home was especially comfortable, orderly, stocked with basic supplies, washer/dryer, BBQ, and the thoughtful assistance from Lisa and the owner were so appreciated. A special highlight of this home was the front porch with comfortable wicker chairs overlooking the walking trails and Rideau River. The neighbourhood was warm and welcoming with easy walking to Bank Street, TD Center, and Billings Bridge Shopping Centre. This house and neighbourhood are truly gems in a large city and helped us enjoy a stunning summer in Ottawa. It would be wonderful to return again! - Diane and Wayne R.
We arrived in the evening and was met with Kristen the following morning for a Q&A session. The layout of the home was good but there were issues regarding cleanliness and housekeeping which Lisa kindly addressed. This left my husband and I at each other’s throats fighting off the ants, it was unpleasant and stressful . We hope it will be rectified for future guests. For convenience and good housekeeping we recommend the dates for garbage and recycling pick up be available for long term guests so they are able to meet these services. Lisa gave us a new garbage can with a tighter lid as the existing one was tired and was constantly ravaged by animals in the evening thus our mornings were spent cleaning the driveway. I guess we were just unlucky to have been met with these inconveniences this time around but we’re optimistic about the future improvements of any property and look forward to perhaps a future stay. The home’s location made visiting with our family in Ottawa a treat and our morning walks along the river were memorable. We stayed here for a week for Grey Cup and we enjoyed our stay a lot. Walking distance to TD Place and Landsdowne where a lot of the festivities were. We loved the river being right out front and enjoyed taking walks along it when the wind wasn't too cold! It was a fair distance to walk to bus stops and bars in the cold wind, but in summer it would be enjoyable. The house itself was charming. When we arrived we had a LOT of trouble opening the lock box to get the key so I hope Lisa gets that taken care of. The kitchen was GREAT - we cooked almost all our meals. Lots of everything you'd need to rustle up and serve a meal from scratch, including spices. One thing that surprised us was that the fridge and fridge freezer were full of stuff - other places we've stayed that offer kitchen use had this space cleared out. But a phone call to Lisa took care of it. We used the BBQ a couple of times - the back yard would have been much better in summer. The bathroom and bedroom were well appointed and comfy. For some reason I kept barking my shins on the corners of the bed frame - it must have just been me though because my husband didn't! We slept wonderfully in the comfy bed. The TV was easy to figure out - thanks for the diagrams for the remote controls! Downstairs was another cute bathroom and some exercise equipment, and a washer, and a dryer that we had to use once after the game to dry stuff :) The stairs to the basement go under a rather low overhang which you have to be sure and duck under. We hardly went down there though. There were a couple of issues with cleanliness in the kitchen because no one had stayed there recently, but Lisa was kind enough to give us a credit for the inconvenience. Overall our stay was very nice, the place was otherwise very clean and charming, and we would go back again! Perfect house on the river! This house is a hidden gem in the city. It was absolutely perfect for my husband and I while we were in Ottawa for a wedding. It is well equipped, clean and private. I could sit on the covered front porch all day and watch the squirrels run around and the herons fly along the river. I would absolutely recommend staying here.